The convergence of insanity and creativity has long been a fascinating source for fiction. So many of our most interesting creative voices have dealt with mental illness (certainly a subject in open discussion right now with the recent passing of Robin Williams), and, while Lenny Abrahamson’s “Frank” has been billed as a wacky comedy about a guy with a fake head (which it partially is), it’s also a dissection of this intersection, driven by a remarkably physical performance by Michael Fassbender. Can you be both creatively brilliant and normal? Can you be mentally damaged and creative within that shattered worldview? And these questions aren’t overly highlighted or treated preciously in “Frank,” a film that is always interesting, largely thanks to an entirely committed cast and a writer willing to play with themes like a band improvising until it finds the right tune. There are a few off-key notes but the melody finally comes together. Jon (Domhnall Gleeson, son of Brendan) is a struggling songwriter who stumbles upon his breakthrough when he sees a member of the band Soronpfrbs essentially trying to drown himself. Offering to the band’s manager Don (Scoot McNairy) that he could perhaps fill in on that night’s show, Jon doesn’t seem to take the warning that the shoes he’s filling could have become waterlogged by virtue of being in a band of crazy people. There’s Clara (Maggie Gyllenhaal), the theremin player who aggressively hates Jon from minute one; Baraque (Francoise Civil) and Nana (Carla Azar), who don’t seem to speak English other than when it suits them; and, of course, there’s Frank (Michael Fassbender), the musical genius of a lead singer who happens to wear a giant papier mache head. Why? Who knows? What’s underneath? Who knows? (Although Frank will explain his facial expressions to you to make conversation easier). What must have happened to Frank to force him to shut out the outside world by hiding his window to it? The bulk of “Frank” takes place at a retreat at which Soronpfrbs works to record new material. And works. And works. Songwriting often takes a back seat to recording odd sounds, running through the woods, taking a dip in the hot tub and general forms of insanity. Frank does most of the writing but it’s material that even alternative music fans would likely dismiss. Months and months of working on new music pushes Jon to question what he’s doing there, especially after his savings begins to finance the retreat rental fees. And he asks such questions publicly, posting confessional and rehearsal videos on YouTube. Wouldn’t you know it, Soronpfrbs becomes something of a viral sensation and they’re asked to play SXSW. What could possibly go wrong? “Frank” is perfectly cast. Gleeson has the right balance of everyman and artist to convey Jon’s difficulty in being the most normal member of a crazy band. At what point do you give up on artistic expression? When the rest of your artists seem entirely unconcerned with your input? When they start physically attacking each other? How about when your lead singer won’t take off his fake head? Jon could have been a pure straight man—our portal into the insane world of Frank—but Gleeson brings just the right degree of charm to the role to make him feel well-rounded without stealing focus from the title character or the action of the piece. 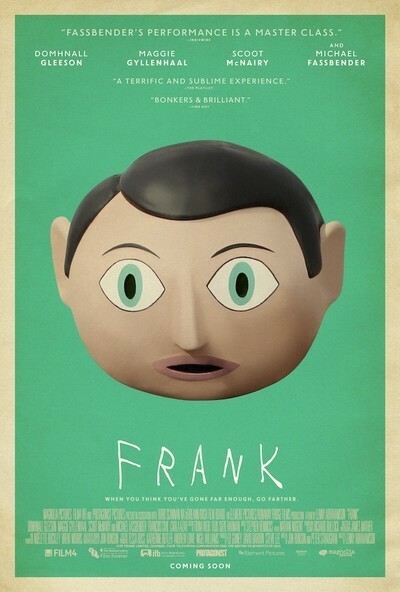 In the end, “Frank” is about Fassbender’s performance, one that only gets richer as the film goes along. Hiding the most utilized tool of an actor under an unexpressive mask forces Fassbender to express his character's arc in different ways. The physicality of a mentally troubled soul is evident even though we never see his face. Watch the way Fassbender uses his body in the recording scenes, as if it’s been electrified by the creative process. And carefully watch the way he responds to setbacks, as if his muscles are actually shrinking as he tries to hide deeper under his protective cover. It’s a great performance. There are some tonal imbalances in “Frank" (and I wish it had as much visual personality and quirkiness as its narrative), but that seems a bit appropriate for a band that’s a bit atonal anyway. Soronpfrbs sounds sometimes like Interpol, who sounded a lot like Joy Division, itself led by a deeply troubled young man with undeniable creative depth. Can insanity, normalcy and creativity co-exist in a successful artist? “Frank” offers a unique, funny, entertaining look at what proves to be an unanswerable question.